That checkout area is tricksy. And now it's kinda fancy, too. Gourmet-sounding, foreign-inspired chookies? Yes, please. I call chocolate chip cookies or any other kind of cookies with considerable chocolate components "chookies" because I'm super in-touch with my inner five-year-old. But the grown-up in me enjoyed the sophisticated European-ness of these treats and the fact that they weren't overly sweet. Did I just rip off a Frosted Mini Wheats commercial? The Due Canestrelli is vaguely reminiscent of other chocolate wafers I've had, but thinner, stiffer, and a little more bitter. They're highly-snackable, satisfying, and unique. 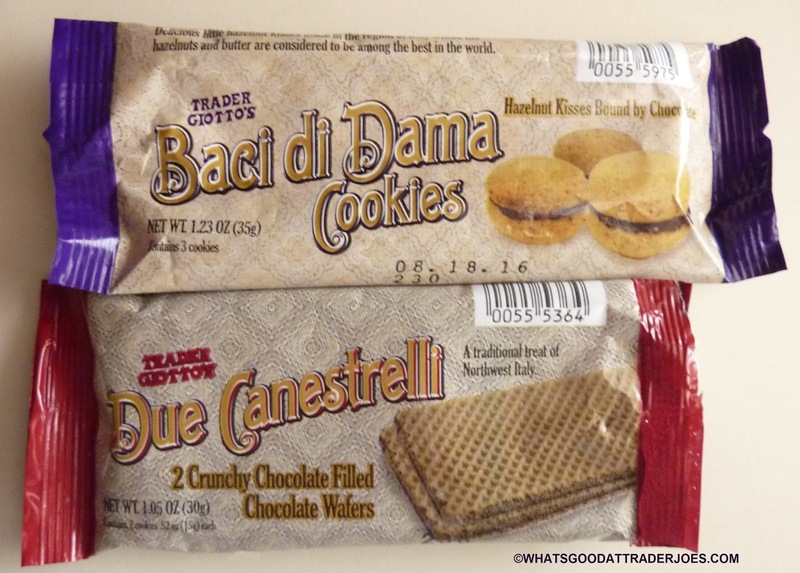 The Baci di Dama Cookies might look like miniaturized macarons, but they're more like a shortbread-based cookie with a thin layer of dark chocolate filling. 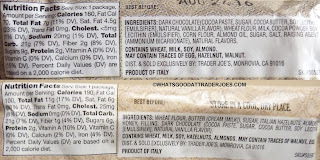 They're not unlike those crispy Milano-esque cookies we looked at last year. Although, I guess these are filled with Italian chocolate rather than Belgian chocolate?? If there's a difference between the two, I can't really detect it. Each of the cookie packs is 99 cents and doesn't disappoint in the flavor department. Sonia scores both with four and a half stars, and I'll give 'em both fours. Cheap, fast, convenient, and small enough that you can eat the whole pack and not feel completely disgusted with yourself. Yes! "Nice chocolate to cookie ratio" is right. I prefer the wafers and have been told by my local TJ's that they are a seasonal item - so sad!